This is the logo I designed over the weekend for the blankets for Victorian bushfire victims project. We have a blog and Yahoo group now, as well as the Ravelry group. Anyone from anywhere is welcome to join in, even a single square is a help. Visit the Yahoo group's file area for web graphics, an information pack, posters, and flyers (also by yours truly). Some knitting content *gasp* - these are Mitt Envy fingerless gloves ... they're knit in 4 ply, and a very quick knit. With cables (doesn't get any better!). These are in Patonyle hand-dyed by Dotter. They're a gift for someone, so I won't reveal who just yet. The only modification I'd make next time around is to make the ribbed cuff longer - they're fairly short. I haven't bought any online knitting stuff for an age - it was time for a treat. 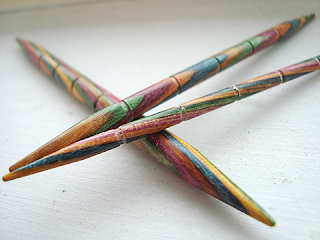 These are Harmony Cable Needles by Knit Picks (from Morris & Sons aka Tapestry Craft) ... so pretty, and the notches in them should help 'hold onto' stitches. Can't wait to use them (they arrived after I'd finished the cabled mitts above). Clearly an excuse to cast on a new project with cables! My uncle is back in hospital, the leukaemia has returned. He starts chemotherapy again today :( Dotter is going all the way for the World's Greatest Shave - yes, she's going to shave all her hair off next month if she meets her target! If you'd like to help her reach her goal, and see her bald, head on over to her page. Mitt Envy - tres gorgeous. Harmony cable needles - envy squared. I adore those cable needles. Nice purchase. And those mitts! Lovely. I want to make them. A lovely donation of your time to make that logo Jejune - its perfect. Oh, and the mitts are pretty spiffy too! Love the knitting. You have such a good heart and you've obviously passed that down to your dotter. The cable needles are ABFAB. All the best for Dotter's shave (how incredible brave) and your Uncle! I see the lady apple does not fall far from her tree. Kindness and generosity runs in your family! Hooray for Dotter and hooray for you. I had a dream about knitting and those round/curved needles. Weird! I don't knit - but you do, and great logo! Love it! I am sorry for the sadness brought on by the illness in your family and wish for your Uncle comfort in the love of those near and dear to him. Sorry to hear about your uncle. I'm sending you healing thoughts. But no head shaving here! I'm just not that brave and it's winter! 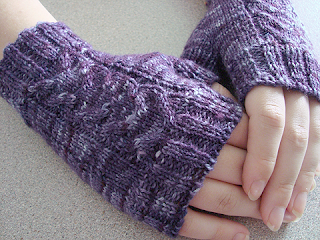 Oh, love the Mitts, they are beautiful and nce to see a 4ply pattern too. Oh such pretty needles!! !